We are open and available year round for weekend retreats, daily getaways, family reunions and week long camp programs. Call today to reserve your space for 2017. 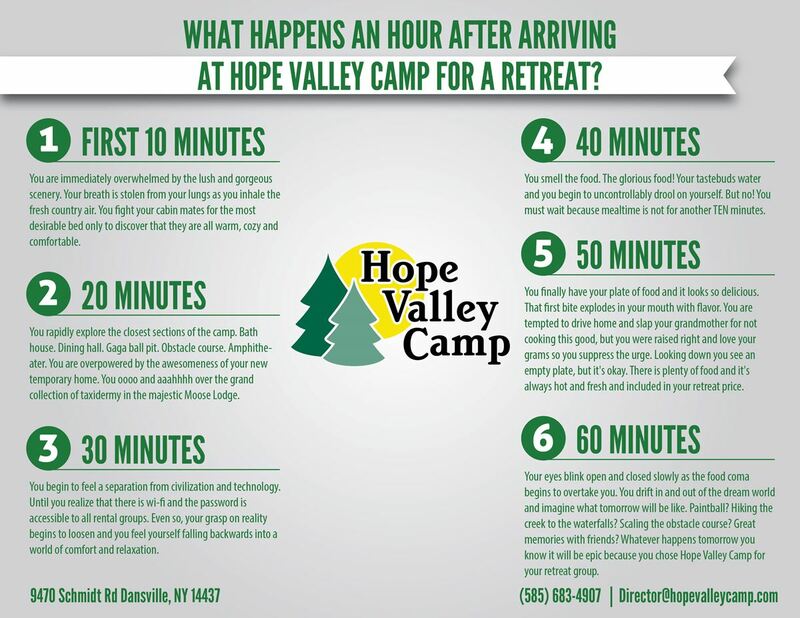 Are you looking for a facility that you can rent to put on your own unique summer camp program? How about a place for a large group gathering? Wedding or vow renewals? Outdoor concert venue? Old time church camp meeting? 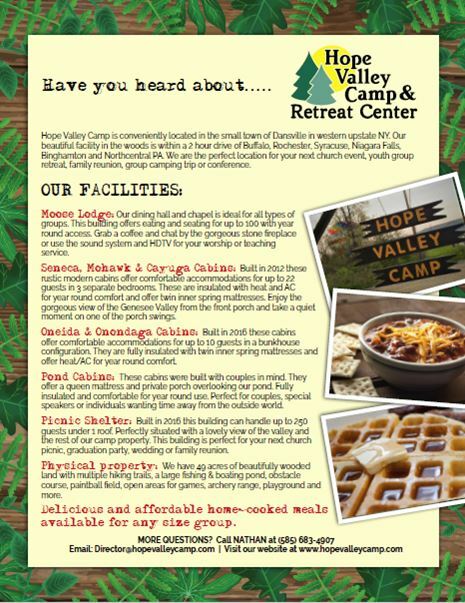 Hope Valley Camp & Retreat Center offers the accommodations that you need to make your event successful. Our newly built facility can sleep and feed up to 100 guests year round. We offer the comforts of home with twin size inner spring mattresses, heat and air conditioning in most cabins. All buildings are fully insulated and comfortable. Our facility is built to look and feel rustic, but also to serve your modern needs. We offer free wi-fi access and have satellite TV if you want to put your feet up and relax. Our dining/meeting hall offers delicious homemade meals and space to hold a large group gathering. Whatever your group needs we probably have it and we can provide you with an event you will enjoy and talk about for years to come. We are open and available year round for weekend retreats, daily getaways, family reunions and week long camp programs. Call today to reserve your space for 2018 and beyond. We DO NOT charge a “per building” fee like some camps. We give you the buildings you need to make your retreat special and memorable. Want something longer? A week in the summer time? A month for a missionary to recuperate? We can custom quote any length of time or need you might have. For your convenience, we do offer the option for direct online booking through AirBNB. The price listed on that website is fixed and does not include food service. You can contact us directly to set up your unique retreat and pricing. We have flexibility on the price when you come to us directly. You can reserve your dates by providing us with a minimum non-refundable deposit of 30% of the estimated cost of your retreat. Any deposit amount in excess of 30% will also be considered part of the non-refundable deposit. Do NOT pay for your weekend in full and then cancel because there will be no refunds of any deposited amount. If you need to reschedule your weekend we will attempt to find you another weekend and will transfer the 30% deposit (minus a 15% or $150 processing fee whichever is greater) towards a new date if it is within 6 months of the original event date. This is with 10 days advance notice of your event. If you cancel within 10 days of the event OR do not want to reschedule for another date within 6 months the entire deposit is forfeited. The remainder (70%) would need to be paid upon arrival at the camp. The number (#) of people estimated for your retreat is the basis for your bill. If your actual attendance decreases you will still be billed for the original estimate. Keep this in mind when making the original estimate. It is better to under-estimate than over. For example: If you estimate 20 and bring 17 the bill will be for 20. If you estimate 20 and bring 30 then the bill will be for 30. Please plan accordingly in your estimates.